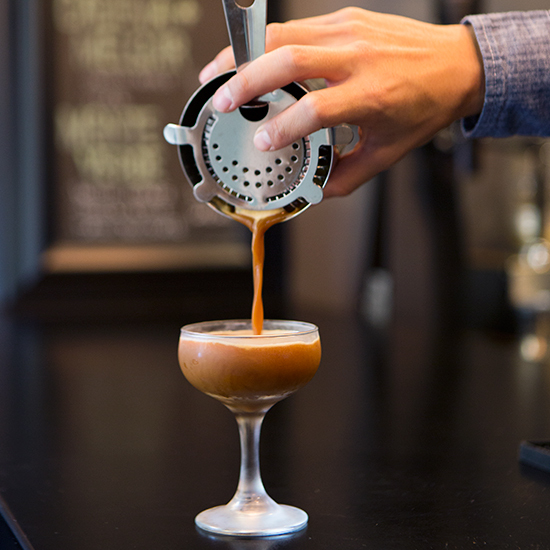 Costa Mesa's Portola Coffee Lab is renowned. Its tiny adjoining coffee-cocktail bar, Theorem, is even cooler. Costa Mesa's Portola Coffee Lab is cool. Its tiny adjoining coffee-cocktail bar, Theorem, is even cooler. Here, 4 reasons why. Portola customers can pick a daily coffee and brewing method, like Bunn Trifecta or V60 Pour Over. The virgin drinks at Theorem mimic classics, like the whiskey sour–inspired New Yorker. Theorem has six drink categories; “Taste” highlights specific coffees. Red Coats is an iced apple cappuccino at Theorem. 3313 Hyland Ave., Costa Mesa; portolacoffeelab.com.